Preventing detention of activists ahead of Gujarat CM programme "no violation of human rights", is perfectly "legal"
In an official communication, the Gujarat police suggests it doesn’t think there is anything wrong with detaining activists seeking to protest against programmes involving state chief minister Anandiben Patel. In a letter to the National Human Rights Commission (NHRC), New Delhi, the state police has justified the detentions, which took place on December 20, 2014, ahead of the chief minister’s visit to Chhotaudepur in South Gujarat. The letter, which is with Counterview, is in response to the complaint by Adivasi Kisan Sangharsh Morcha (AKSM) chief Romel Sutariya, who was among tens of tribal farmer activists detained. Sutariya and his colleagues had planned protest against “failure” of the Gujarat government to act against sand mafia, corroding the local river, as also failure to pay dues to tribal farmers for sugarcane sold to a local industrial cooperative. AKSM is an upcoming tribal farmers’ organization in South Gujarat, currently operating in two new districts – Chhotaudepur and Vyara – situated between the Narmada dam and Gujarat’s cultural capital, Vadodara. Sutariya had made the complaint against “illegal” detentions, ordered by the then district police chief, Chhotaudepur, Rajan Sushra, on December 29, 2015. The NHRC sought reply from the state police on February 27, 2015. The reply, signed by Anupam Singh Gahlaut, deputy inspector general of police, Vadodara range, was sent on May 11, 2015. While in between a large number of similar detentions and arrests have continued all over Gujarat, including of Jayram Gamit, a tribal activist under the Prevention of Anti-Social Activities (PASA) Act for above a month, and more recently of Sutariya for a four days, a Gujarat court recently termed Sutariya’s arrest “illegal” (click HERE to read). The Gujarat police letter to the NHRC says, the applicant, Sutariya, had alleged that the district pulice chief, Chhotaudepur, had “misused the police powers”. It says, “The complaint of the applicant, has been enquired through”, and that “the representation made by the applicant Sutariya is not true”. (1) Eight persons of Sankheda police station area were detained under the Gujarat Police Act, under Section 68 (preventive detention), on December 20, 2014 at 10.30 am, and were set free at 4.35 pm after the programme was over. (2) Four persons of Bodeli police station area were detained under the same section on that day at 8.45 am and were released the same day at 5 pm after the programme was over. (3) Two persons of Jetpur Pavi police station area were detained, again under the section and on the same day at 11 am and were released under on the same day at 3.00 pm after the programme was over. 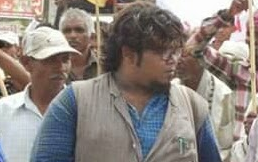 (4) Sangramsinh Naranbhai Rathva, a youth leader under the Chhotaudepur police station area was similarly detained on December 20, 2014 at 1.10 pm, and was released at 3.05 pm after the programme was over. (5) Romel Sutriya, was also detained under the preventive detention section on the same day at 08.30 am and was released at 3.05 pm after the programme was over.